There are so many cars that run in big, multi-class endurance races like the WeatherTech Sportscar Championship’s upcoming 24 Hours of Daytona that it can be hard to tell them all apart. 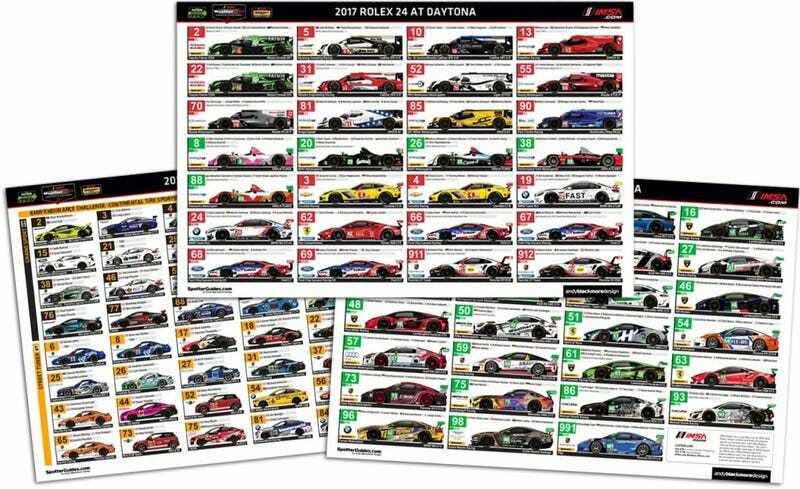 Fortunately, Andy Blackmore has his annual Spotter Guide out for the Rolex 24 so you can tell them all apart. It’s the beginning of a new year, with an all-new Prototype class, several new GT cars and many, many new liveries. While this makes us extra-fond of Starworks Motorsport’s neon “Please Don’t Hit Me Pink” and “Hey, We’re Right Here Orange” liveries because they’re easy to spot, we know you’re curious as to which of the four nearly identical Ford GTs ate it in the Horseshoe, too. The Spotter Guide has all the details you need to identify each of the 55 cars running this weekend: team names, driver line-ups, classes, tires and kind of car, plus any defining marks to help you identify them. You’ll also find the same information on the entire Continental Tire Sports Car Challenge field, which has a relatively short four-hour race ahead of the Rolex 24 on Friday. We want you to be shaking your fists and mad-tweeting at the correct vehicles this weekend, so go download Blackmore’s 2017 24 Hours of Daytona Spotter Guide here. Happy watching!